From Chiang Mai we drove to a town named Chiang Dao. 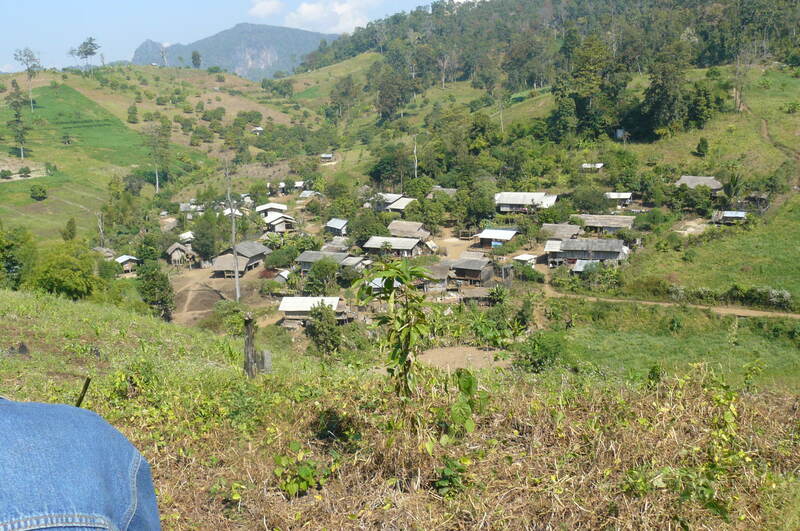 We then sat in the back of a pick-up truck and were driven to a small hill tribe village of the Lisu minority. It was very small and there were chickens and pigs everywhere. 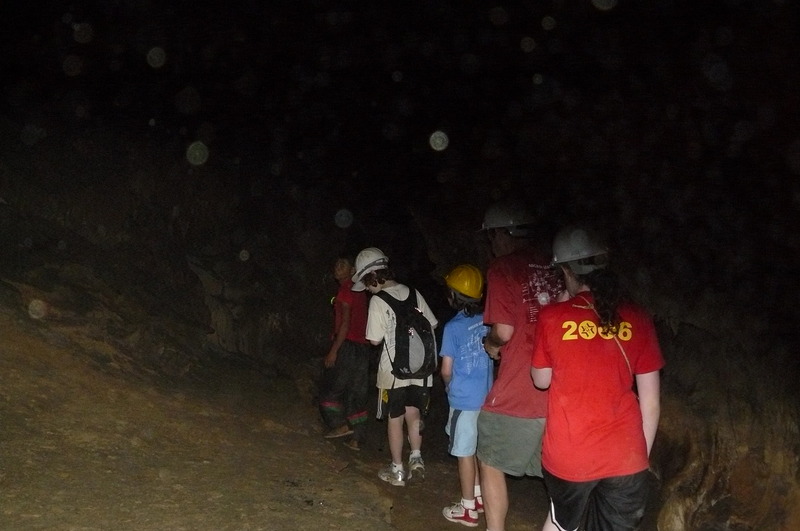 We then walked to a cave. Out of all the many caves we’ve been to on this trip, this one was by far the best. 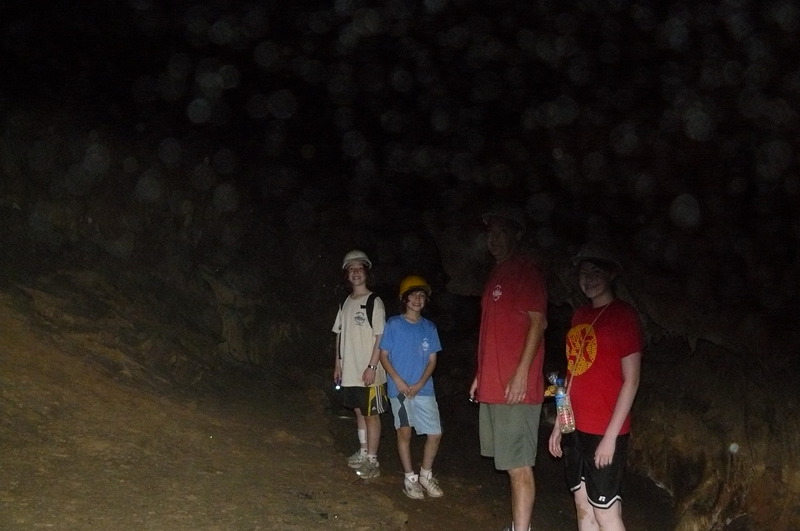 It was pitch black, and there were stalactites everywhere. 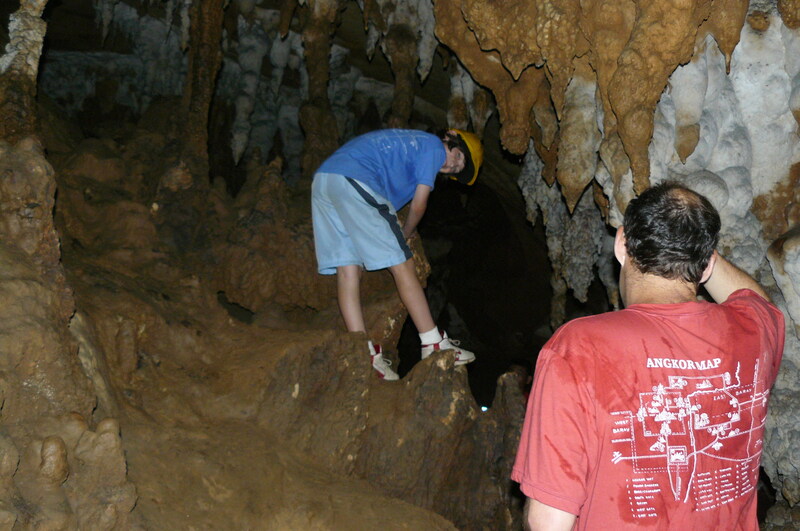 We had to crawl through extremely narrow passages following our guides who didn’t speak a word of English. We got very dirty, but it was ok, because at least the company who we had booked through had given us each a packet of the most spectacular cookies we’ve had. They were the perfect mixture of sweet crunchiness and a filling of nice gooey jam. After that we had lunch in the village. I ate rice. Not the greatest meal. We then hiked to a waterfall, having to cross little streams and walk across logs. 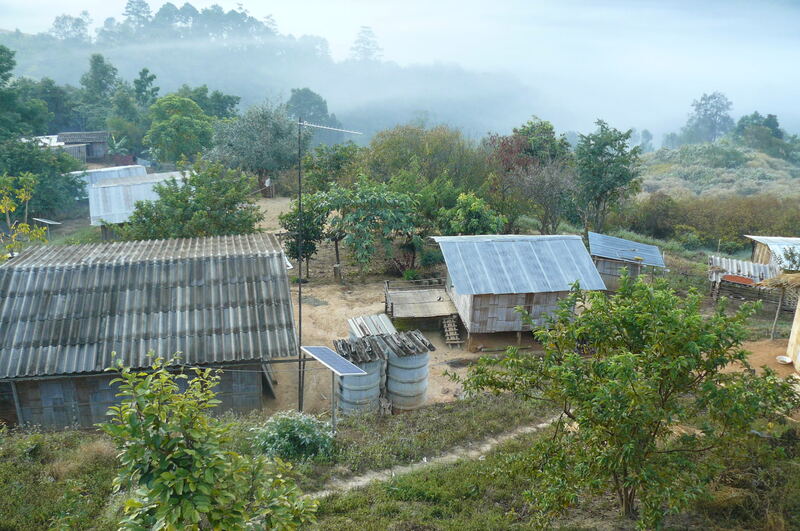 Then we walked up a steep hill to the village we would be staying the night in. We reached our village, which didn’t really seem like a village. It was a few houses here and there. I think we had this idea that there would be streets and a few shops and something to do. We decided we’d walk around, and came across the best wildlife we’ve seen. My dad quickly exclaimed “It’s a tiger!”. It was an overlarge pig with hair and stripes. 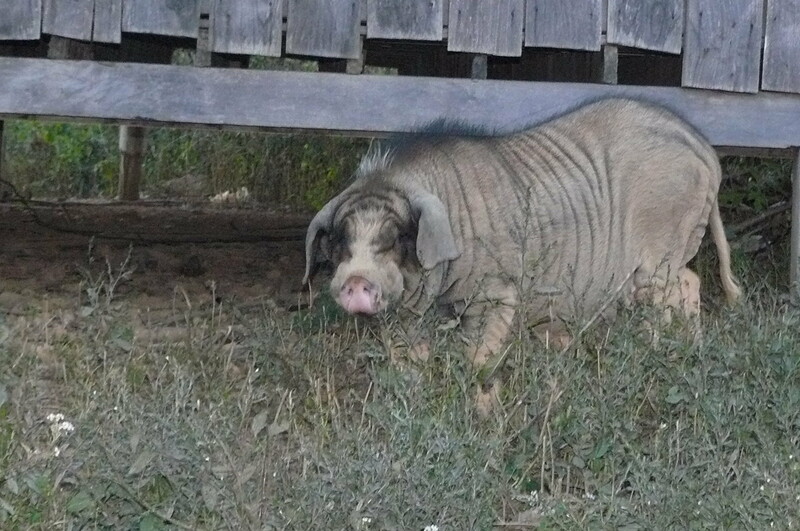 That creature had to be the definition of ugliness itself, and imaginatively enough, we named it ‘Tigerpig’. We then watched the villagers play soccer in their interesting traditional garb, baggy brightly colored pants that looked as though they could have come out of Aladdin. I ate rice for dinner again (wow I can’t wait ‘till we get to Sydney!). It was then about six thirty, dark, and there was nothing to do. But we couldn’t go to bed that early. We finally went to sleep in our thatched hut. The villagers must think we’re crazy, paying money to come sleep on the floor of their hut! For their part, our hosts showed that even in this place, they knew how to have a good time ! They drank – it looked like all kinds of alcohol – until late into the night, getting louder and louder as time wore on. My mom, getting sick from the strange food, and possibly getting a little crazy, started worrying there were ‘bandits’ (her word, not mine) outside who may try attack us crazy tourists at any time. So she insisted my dad get up from his mat and latch the ‘door’. Considering the whole hut was made of bamboo and anyone could walk straight through the ‘walls’, it seemed an odd request, but maybe it made her feel better. Next morning we packed up and went back to our hotel, from where we would be doing the second part of our trek. When we were almost there, driving in the back of our pick-up, this guy got in for some reason. He was old and had strangely dyed hair, was carrying a bag of odd meat, and holding a machete. Wouldn’t want to get on the bad side of him. Anyways, he asked us all these questions, and commented on how my mom had three nice daughters. I can’t imagine how anyone could think my brothers were girls. He then asked my mom, very indignantly, “who are you?” and we could not figure out what he meant. We finally figured out it was “how are you?” but still a bit out of place. He proceeded to ask us how long we were here for, and we thought he meant in Thailand, so we said ten days. He then threw back his head, and exclaimed ‘WOW!’ very strangely. We came back to Chiang Dao, ate a second breakfast, and drove to the elephant station with our guide. The elephant Ilani (my brother) and I rode on was very large, and kept sneezing on us. This was a bit unpleasant because it would shower us with sneezes, since it is such a large animal. 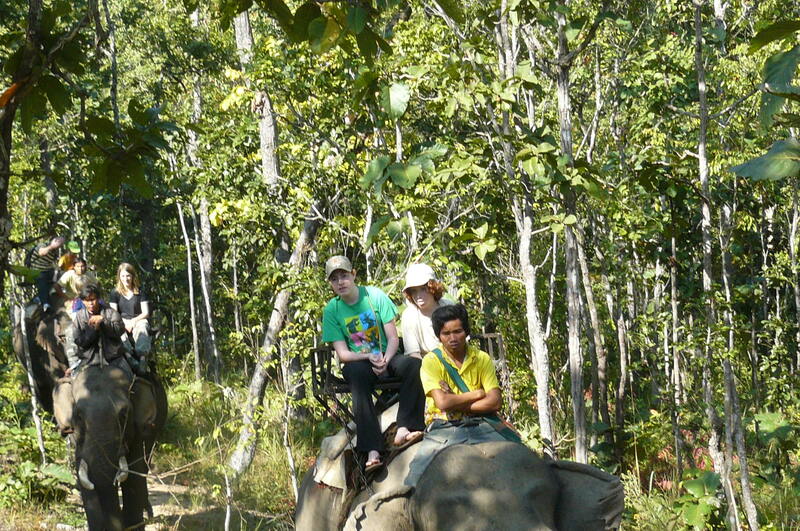 Our mahout was not very nice, and kept screaming at the elephant, and hitting it with a pole. He then asked us if we wanted to ride on the elephant’s neck, so we did. 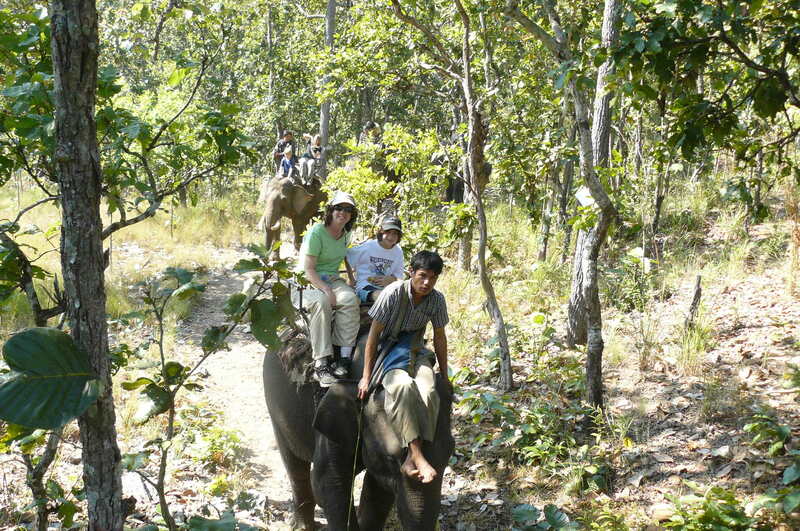 My mom and Benjy’s mahout was a lot better. Apparently, everything he said he would sing, which is a little strange. The elephants took us to our first village, which was the best by far. The people were dressed in their traditional dress, and their teeth were stained black from betel juice. We visited the school, where the children are learning English as young as four years old. One of them tried to hold us hostage. “Elephant, elephant, have you ever seen an olophent, long nose, two eyes…” We could not figure out why he said elephant the first time and olophent the second. He then sang it in Thai, (chang, chang…) and there were the same words for olophent and elephant (chang), so clearly they must be the same thing. The whole olophent thing was a mystery to us. From there our day became stranger. We sat in a village for forty minutes waiting for our car. The village had about two people, and was the least exciting place ever. Our guide decided to entertain us with some magic tricks. Finally we left, only to go to another village with not one person in it. We walked down the street, and were overjoyed to see a shop where we might be able to purchase some refreshments. We had to share our vehicle with some Danish people on the way back because theirs broke down. Our guide decided that we were hungry, so proceeded to tell us two folk tales that we couldn’t really understand. One was about a man who killed his mother with a lunch-box, and the other was about a guy who killed his wife with a vegetable. He was sitting there smiling away the whole time. The moral of the story? Don’t kill people just because you’re hungry. We had packed lunches, and for some reason the rice had all mushed together so that it was a square rice popsicle or lollipop. My tofu was like a tissue in food form, or water. It had absolutely no flavor. After this odd lunch we went on a bamboo raft. It was pretty bad. It was unbelievably boring, and there was elephant poop floating around everywhere, and getting stuck to the raft. Yuck. It was all rather weird, because the trip was advertised as being wonderfully scenic. Having done similar things on the Li river in China, and then in Vietnam, we understood how beautiful the surroundings could be. But here there was nothing, and even if there was, we had to concentrate really hard to keep our feet away from the elephant poop that kept encroaching on our rafts. The best part of that day was probably getting back.